Separation and divorce create major changes for families. Plans for the children, division of property and financial arrangements all need to be worked out. It is also a time of great emotional upheaval. These changes and emotions can result in conflicts between family members. How these conflicts are handled will influence the entire family, especially the children, for years to come. For most people, conflict is frightening and stressful. Conflict can, however, result in the productive airing of differences and lead to creative solutions that address the changing needs of all family members. Too often in the divorce process, family members feel like bystanders while lawyers, judges, and others work out these crucial issues. Even in the face of anger, fear, and pain, it is possible for people to negotiate an agreement which balances the interests of each family member. Before attempting to reach an agreement, however, it is important to have a basic understanding of the law in this area. A limited divorce specifies the rights and obligations of the parties, but does not provide for final division of property (including pension and retirement funds) and does not permit remarriage. Uninterrupted desertion for at least 12 months, which is deliberate and final and which there is no reasonable expectation of reconciliation. Parties are voluntarily living separate and apart without cohabitation for 12 consecutive months and there is no reasonable expectation of reconciliation. Conviction of one of the parties for a felony or misdemeanor in any state or in any court of the United States, where the party has been sentenced to serve at least three years or an indeterminate sentence in a penal institution and 12 months of the sentence have been served. Parties have lived separate and apart without cohabitation and without interruption for one year. Mutual Consent: Recently the Maryland divorce laws have been modified to allow married couples to obtain an absolute divorce without the (1) one year waiting period provided there are no minor children and there is a written separation agreement that resolves all marital issues. All requirements for each ground must be met before filing for divorce. There are additional requirements, including residence in the state, in most circumstances. An attorney can help you determine if the requirements have been met. In many instances, the parties voluntarily agree to live separate and apart until they can obtain a divorce. The individuals involved may agree among themselves, or after negotiation on the parties' behalf between their respective lawyers, about the division of their property and other questions pertaining to alimony, child support, custody and visitation. The parties enter such an agreement in writing. This document, known as a settlement or separation agreement, fixes the rights and responsibilities of the two parties between each other. It is a binding contract between the two which can generally be enforced by appropriate court action. Contrary to popular opinion there is no such thing as "a legal separation" in Maryland. There is no "filing for" a legal separation in Maryland. If however you are separated from your spouse, it is most advantageous to reach a written marital property and settlement agreement containing applicable provisions for child custody, visitation, and child support. If you can reach an agreement on all issues after you have been mutually and voluntarily separated for one year, you can file for an uncontested divorce and simply have your separation agreement incorporated into your divorce decree. If for any reason either party alleges that it is not a mutual or voluntary separation, after two years, either party can file for divorce over the objection of the other party. There are other grounds for divorce that have different time limits such as adultery, desertion, and cruelty of treatment. This is a relatively recent change in the law, from two years to one year. You should consult your attorney about the time limits, rights, and responsibilities under these various forms of separation. Alimony is payment for the support of a spouse. Under the law of Maryland, either party may claim alimony from the other. The fact that the party seeking alimony may be guilty of some ground for the divorce does not prevent an award of alimony. facts and circumstances leading to separation. Courts have always given the highest priority to the needs of the children in divorce proceedings. Each party has a responsibility for the support of a minor child or children. A formula called The Child Support Guidelines is now used by the court to determine the amount of child support. Child support awards are primarily based on the gross incomes of the parties, but each case must be considered on its own facts and circumstances. We can help with questions about enforcement as well. We work with the Maryland Child Support Enforcement Program in order to ensure that both parties are living up to their collective bargains. Marital property is defined as all property acquired by either or both parties during their marriage regardless of title. It does not include property acquired prior to the marriage, property acquired by inheritance or a gift form a third party or property excluded by valid agreement or traceable to any of these sources. Whether or not alimony is awarded, a court may still make a monetary award based on the value of all marital property to adjust the rights and equities of the parties in the division of the property. In determining the award and amount, the court is required to consider many factors. It is important to bear in mind that the court does not have the power to change the title to property, except for pensions and retirement funds, but may adjust the rights of the parties by giving a monetary award. If either party has a pension or retirement fund entitlement, it is essential that an attorney who is knowledgeable about such matters prepare all necessary documents. Maryland courts award legal and physical custody of the minor children to one or both parties according to what is in the best interest of the children. If physical custody is awarded to one party, visitation rights will generally be granted to the other party. Decision-making power regarding the child (or legal custody) may be awarded to either party separately or to the parties jointly. The sad reality is that many people come to the court to solve their family matters, because they are collectively too immature, angry, bitter, hurt, or otherwise acting out of selfish interests to calmly and rationally decide what is in their children's best interest. All too often, the children become pawns in a vicious tug of war, and the parents essentially turn to a stranger in a black robe who only briefly observes a snapshot "performance" by people who are trying to look their best when they are functionally at their worst. The long and short of it is that without an agreement, the judge decides the fate of your children. It is his or her best guess as to what will happen in the future, and that guess is based upon very limited knowledge that can be gained in a courtroom setting governed by rules that most people do not understand. In the vast majority of cases, when people turn to the courts to decide child custody visitation rights pertaining to their children, there is usually no "winner" and almost always the children are the true losers. It is this author's opinion that much more time, effort and energy should be spent on resolving custody and child access disputes by way of counseling, mediation, or through as many settlement conferences as it may take with attorneys who are willing to work towards a resolution outside of litigation. Here at the Law Offices of Michael Mastracci, we work with you and your partner to first attempt to settle all matters out of court, to come to an amiable agreement that both side can live with and is in the best interest of the child(ren). For a flat fee of $200.00 you can get an in-depth consultation and strategy session by phone (including evenings and weekends) and have it deducted from your final bill if your retain our services. Let�s face it, when it comes to separation, divorce and/or child custody situations most people don�t know what they don�t know until spending countess hours of fighting and perhaps tens of thousands of dollars in lawyer fees and litigation costs. The goal of this special offer is to give you an opportunity to gain a practical overview and a basic education about the topics that are important to you and your family BEFORE you potentially do it the hard way. Doesn�t it make sense to learn about the different avenues available and where they may likely take you and how much those options can cost in real dollars and in more than dollars alone in advance? As of October 2018, under certain/additional circumstances parties do not need to be separated for one- year before filing for a divorce. When it comes to children it is always advisable to have a detailed parenting plan that can be filed with the court. Do you have one? Some things that should be considered include, but are certainly not limited to: the primary residential schedule, holidays and vacations, summer schedules, selection of schools and medical providers, moving, third party involvement, stepparents, child care arrangements, child support, financial issues, sole vs. joint custody, different rules for different houses, allegations of drug and/or alcohol abuse, etc. Mediation- many people have heard of mediation. The courts often require people to participate inmediation. What is mediation? How does it work? What are the pros and cons of mediation? What are the costsas compared to collaborative law and litigation? Will the mediator be a lawyer? Can my lawyer be the mediator? Collaborative Family Law� for the best explanation go to www.collaborativepractice.com. In short, each party hires a collaboratively trained-attorney and everyone signs a collaborative participation agreement and pledges to attempt to settle the case without going to court. They engage in ongoing scheduled meetings to resolve issues. If the process should break down, neither collaborative attorney can continue to represent his or her client in court. Learn why this is actually a good thing and the linchpin of the collaborative process. Litigation- basically, this is the �see you in court� stance and is the most expensive, time consuming and unpredictable way to do it. This position generally causes the most damage, especially when there are children involved. There is often this ill-fated notion that a judge will listen to your side of the story and you will be happy ever after. It just does not work that way. By the way, how long does it take to get before a judge? What is life like in the interim? Typically, parents who did not get along before court get along even worse after court. Depending on the facts of your case, I may be able to assist you with an appropriate referral as I have a comprehensive referral network of attorneys from collaborative to litigation, mediators, therapists, child psychologists and the like. Often the other side�s choice in attorney is key in determining who you should hire. That may be something worthy of discussion if the other side has an attorney and you have not yet retained one. We will delve into the facts of your case as sometimes what is appropriate for some is not advantageous for others. The above issues and any other related topics in general and in particular to your circumstances can be discussed for up to one hour by phone (including evenings and weekends) for only $200.00 (paid in advance). Call 410-869-3400 or send an email to mike@mikethelawyer.com and be sure to reference this Legal Information, Education and Strategy Session offer. You may also go to our website home page and make a secure payment under �Retainer Payment� we will each be sent an email receipt and the call will be scheduled. Please note that this email and any subsequent phone call does not establish an attorney-client relationship. Unless there is a signed retainer agreement for specific work there is no obligation for attorney to perform services beyond the up to one-hour phone call offered herein. I have been handling contested divorce and child custody cases for thirty years. 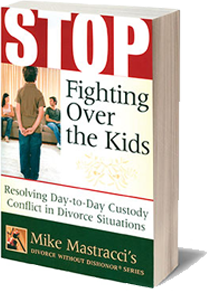 I am a mediator and family law practitioner and the author of the award winning and widely acclaimed book: Stop Fighting Over the Kids: Resolving Day-to-Day Custody Conflict in Divorce Situations. I have seen a lot and been involved in many high conflict cases. Usually, in those situations, there are never any winners. The small fee you will pay could end up saving you a lot of heartache and thousands of dollars. It gets even better, if you retain our services within (90) days of your call the $200.00 fee will be deducted from your final bill. I am sure that I can assist you.